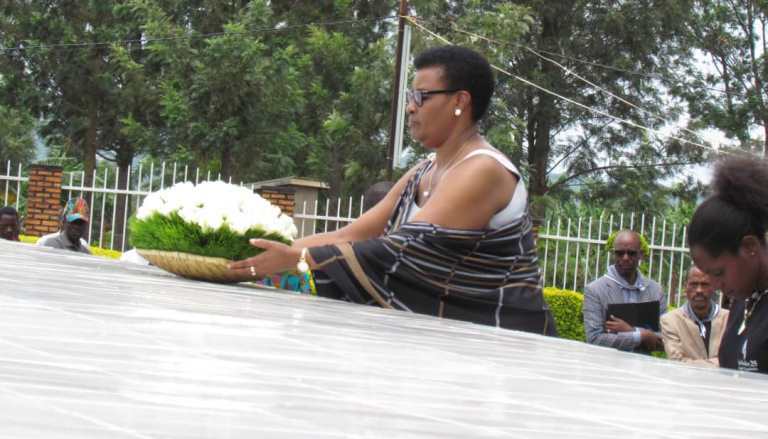 Mukabalisa Donatille, the Speaker of Parliament, on Wednesday joined hundreds of Residents in Kiziguro sector to pay tribute to victims of the 1994 genocide against Tutsi as part of the ongoing Kwibuka25. Kiziguro sector is part of the former Murambi commune which during the genocide was led by a notorious burgomaster (mayor) Jean Baptiste Gatete. The speaker flanked by senators, deputies and other high ranking government officials and residents gathered at Kiziguro memorial site and laid wreaths at the burial site of over 14000 victims. Hon. Mukabalisa told residents that it was a pity that Rwanda was once led by leaders who planned and executed genocide against Tutsi. She promised residents that never will such occur again. Gatate presided over the swift killings within this part of the country; for example 14,390 victims were killed in only four days and 3,700 Tutsi hiding in a nearby church were killed on the morning of April 11, 1994. In a moving recount of events before and during the genocide in Kiziguro, Father Laurent Rutinduka gave his testimony on how he survived. Soldiers of the Rwanda Patriotic Front Army arrived at Kiziguro and secured the entire area and saved many at the church. The bodies of Tutsi that were killed inside the church had been thrown in the 30 meters deep and long pit about 200 metres away from the church. It had been prepared by burgomaster Gatate that would be used to dump victims. Gatete had worked out a plan with burgomaster Onesphore Rwabukombe of neighboring Muvumba commune to expel Tutsi from Muvumba and neighbouring districts and seek refuge in Murambi. As early as February 1992 this plan started getting implemented- Interahamwe began transporting the Tutsi in trucks and killed them then dumped their bodies at this massive pit in broad day light. Long after the RPA stopped the genocide, Gatate who had fled to neighbouring DRC, was arrested in 2002 and sentenced to 40 years imprisonment by the International Criminal Tribunal for Rwanda (ICTR) in 2011 for Genocide and crimes against humanity.